« ChromeOS is *not* for consumers. This entry was posted on Wednesday, January 19th, 2011, 9:53 am and is filed under Uncategorized. You can follow any responses to this entry through RSS 2.0. You can leave a response, or trackback from your own site. Stop spoiling it for everyone. The “Google is sticking it to Apple” story is much more entertaining than the prosaic facts. Sincere question – how will WebM improve over time (in terms of quality and feature set) without infringing on all those patents? slow). On that I believe that it is possible to improve substantially without infringing patents. Ah! But I am trying to spoil fun for everyone! Despicable me! Yes – it is Chrome that embeds native mp3 and H264 support, thanks to a license obtained from MPEGLA. Let’s hope John Gruber (of Daring Fireball) reads this! Quoting: Considering that most H264 players are limited to the “baseline” H264 profile, [...] we can safely say that WebM is or can be on the same quality level of H264. 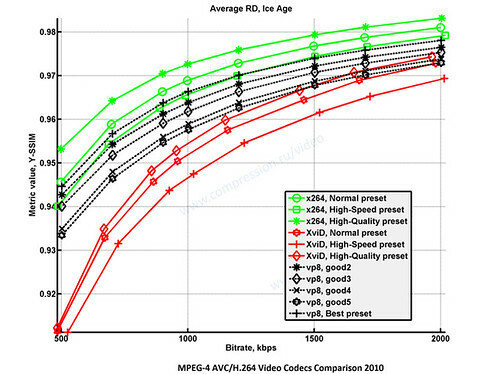 But isn’t the graph saying the opposite, with VP8 *best* on par with x264 *worst*? Am i misinterpreting the graph? 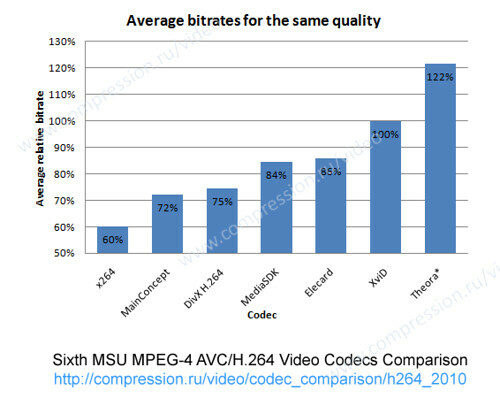 Or is it assumed that the bitrates used for HTML5 video will be around 500kbps, where VP8-best matches x264-normal? The “mostly just baseline” myth doesn’t work anymore — the vast majority of smartphones made over the last few years easily support main profile up to 720p at 30fps. The advantage of MPEG-LA over Google is that patent holders have a choice to join a patent pool that would advance their mutual interests. If a patent holder knows about a patent pool, but chooses not to inform the pool of their patent, it could be found as an indication that they waive their right to enforce their patent (e.g. Qualcomm v. Broadcom (2008)). The members of a patent pool would also have a common interest in protecting their patents against a patent holder outside the pool. Therefore, the patent risk is lower with H.264 than VP8. The problem in Qualcomm/Broadcom was that a Broadcom employee was participating in the mailing list debating the very same standard, and thus falls within ISO rules; if such a participation was not to be proved, the waiver would have been not granted. In fact, MPEGLA does not automatically guarantee that licensing a pool provides guarantee against any other patent claim – a company may be part of the patent pool for one standard, and not part for another, and if it finds that it infringes on its IPR is perfectly in his rights to go through a legal suit or ask compensation. Also, cross-agreements between patent holders in a pool may prevent legal retaliation against an outside member claiming patent infringement. So, all given, I would still claim that, until MPEGLA finds an infringing patent, VP8 is *at least* on a par with H264, and if no other patent is found, probably better. The advanced smartphone profile still applies only to iphone4, ipad and Apple TV; for the advanced profile, “Nexus One, Droid, maybe others. (YMMV on these, though. Some users report trouble with 720p video. )” (something that I can confirm). This hardly makes for “the majority of smartphones made over the last few years”, even excluding the largest installed base, Nokia (that would not know an advanced profile if it bite it in the cpu). Even conceding that H.264 video will be limited to the baseline profile, why assume that the situation with WebM will be different? BTW, my prediction is that serious video sites will have both H.264 ‘advanced’ video and WebM as a fallback. A very good addition to the HTML5 video tag would be automatic fallback, we don’t want to go back to ugly User-Agent sniffing. Note that the H.264 encoders tested in the Russian comparison were encoded at High Profile (as indeed are most comparisons you see). Not only does this not play on the vast majority of mobile devices with hardware support, which are restricted to Baseline, but even the most recent iPhone and iPad are limited to the Main Profile. It’s actually quite difficult to find videos encoded in this middle setting, most people jump straight from Baseline to High as there is little benefit to doing so. You may think that recent iPhone 4 and iPad support is enough, but if the next version (or the one after that) does actually support High Profile, are you really going to supply 3 different encodes just for iDevices alone? All streamable content out there is either MPEG2 or H.264. Bandwidth is not a problem anymore. Can anyone explain to me why I have to re-encode in realtime 120 DVB streams to WebM if I want to offer my customers access to all their TV stations over HTTP when they are away from home? Using H.264, I only have to re-encode a few of the streams from MPEG2 to H.264 and simply stream the raw transport streams from the other ones. Until someone can provide an appliance that re-encodes H.264 1080p50i content to WebM in real-time for up to $500 per stream, I think that it’s ridiculous to assume that we can move to WebM. Regarding possible patent infringements on H.264, a common argument is that because H.264 has such wide adoption at this point that any party that was going to claim infringement and compensation would have done so by now. Basically, if you are going to be a patent troll, you wait until there has been enough adoption to make your payday as big as possible. Because WebM had very little adoption, patent holders have not been motivated to seek compensation, but if it becomes a standard as Google seems to be promoting, the trolls will come out of the woodwork. The fact that there is a patent pool with quite few members and that H.264 is in wide use at least makes it seem less likely that patent infringement will arise at this point. Obviously it is still possible, but it it seems much more likely to happen with WebM. Microsoft tries undoing Chrome’s H.264… | Advanced E-Commerce,E-Business, Online Store Solutions | Advanced E-Commerce,E-Business,Online Store Solutions|CyberSharq Inc.
» A better analysis of WebMs strengths and weaknesses Lies, all lies!